Most of our members are adults with full-time jobs and families. Some are active or prior military others are civilians. Some are green to the ArmA experiences others have been playing ArmA since 2004. If you enjoy teamwork, leadership, cohesion and are always seeking to improve and better yourself, this is your home. Our unit hosts a Second World War length campaign that runs from Operation Torch to the last days of the European theater. 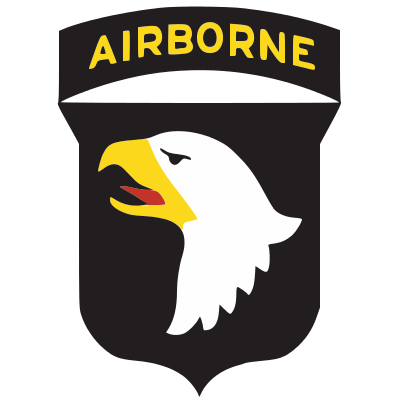 While our namesake is the 101st Airborne, we may fight the great battles of Europe as the 82nd Airborne, 2nd Armor Division, and other U.S. Army units. We are a military simulation unit, this means we have assigned billets and positions. Ranks are proportional to our needs, same with medics or aviators. Leadership courses are also available to Corporals to begin taking control of a squad. Our Staff Sections are organized similarly to the real world S-1, S-2, S-3, S-4, S-5 they assist our unit with all the behind the scenes needs for running the unit. New recruits coming into the 101st Airborne Division, 506th PIR go through our version of Basic Combat Training (BCT). From there they are placed into an open billet of their top choice if available. Members who select medic or pilot will need additional training in the Medical or Flight School. The pipeline for aviators joining the 9th Air Force is much the same, with the needed requirement of Flight School before being commissioned a Flight Officer.